With the release of the iPhone 7 in September 2016 Apple decided to remove the 3.5mm headphone port. There were rumours about this for some time so it was not a surprise when Apple announced it was gone. That said, it has caused much controversy on the web and many are unhappy about the decision. 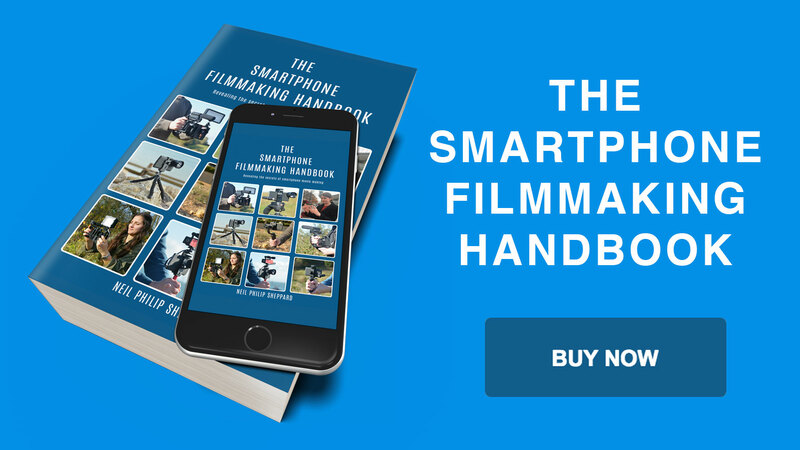 For most iPhone users it means having to use expensive wireless headphones but for iPhone filmmakers and journalists it creates a new set of problems. 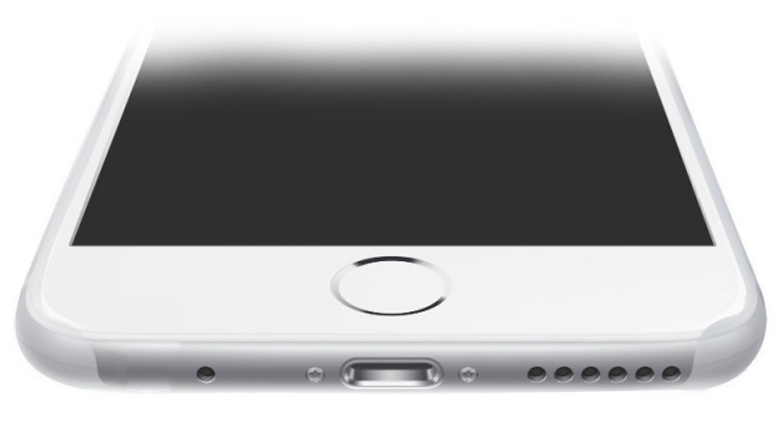 If you take away the headphone port you also take away the microphone port. I could go on all day about how this was not smart by Apple but what is done is done. They are not going to put it back so let’s look at how to solve the problem. First the iPhone 7 comes with a 3.5mm adaptor to lightning port so you can still plug in 3.5mm headphones. This adaptor supports TRRS so you can still go hands-free with a microphone connected to headphones. If this is the case then microphones with the TRRS plug should work with the supplied adaptor. At the time of writing this has not been tested but I am confident that this should still be the case. So that’s that then! Well not quite. Any audio technician will tell you the more adaptors you have to use the greater possibilities of something going wrong. There is also the issue of the analogue 3.5mm conversion to digital lightning port. There is no suggestion how good this is or if it is reliable. If you are not keen in using the supplied iPhone 7 3.5mm adaptor then your next choice is to use a dedicated microphone that uses the iPhone’s lightning port. 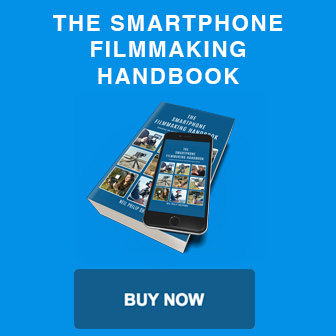 Luckily there are already a few on the market that should work with the iPhone 7. The problem with these microphones is that they draw power from the iPhone and this can reduce battery power. Also with the lightning port in use for the microphone you can no longer charge the iPhone. So all that considered here is a list of some of the microphones available at the moment that should work with the iPhone 7. Disclaimer: At the time of writing none of these microphones have been fully tested with the iPhone 7. All the following microphones connect to the iPhone’s lightning port. 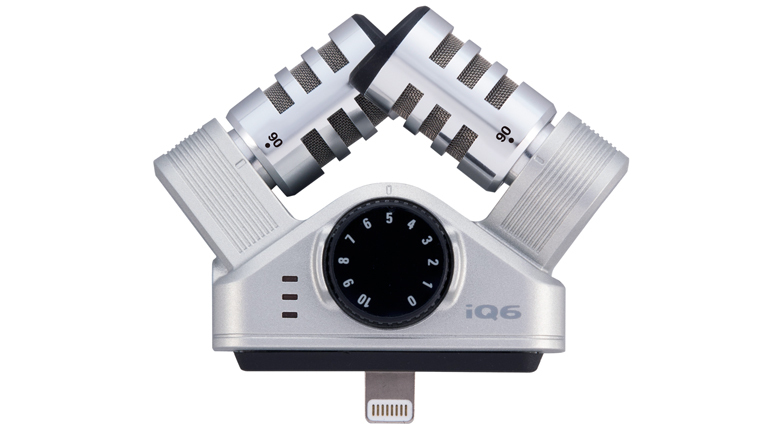 The Zoom iQ6 is a unidirectional condenser microphone that plugs into the iPhone’s lightning port. 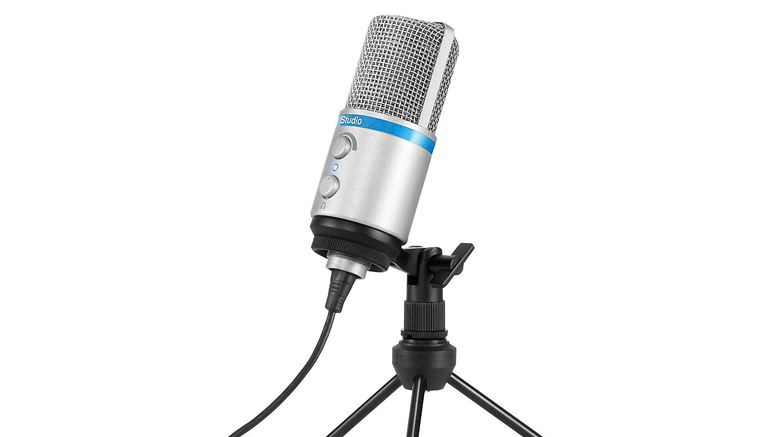 It features two high quality condenser microphones in an x/y configuration and if you are familiar with the Zoom h4n you will recognise that they are the same microphones in use on that device. You can change the microphone angles from 90 to 120 degrees to get different audio capture angles. There are level controls to adjust input audio gain so you can get the correct levels on your Smartphone. There is also a headphone port for audio monitoring. 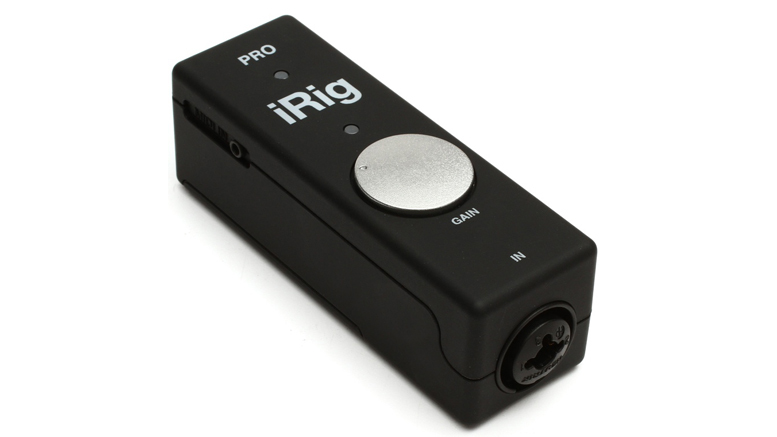 The Irig Pro is an XLR/1/4” combo adaptor to allow you to connect any XLR microphone to the iPhone’s lightning port. It is compact in size and comes with two connectors for lightning and USB. On the front is a manual gain control knob so you can adjust input gain. It also has a built in preamp to help reduce hiss and give more gain. Built into the unit is a high-quality A/D converter which means it converts the analogue signal to the lighting port and can go up to 24 bit and 96kHz. So you microphones should lose no sound quality. It also has built in phantom power so you can power microphones that need it. 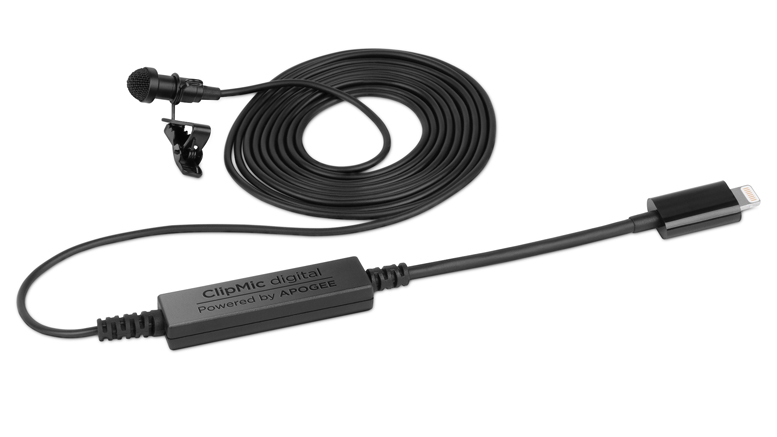 If you want a good quality lapel mic that connects to the iPhone’s lightning port then the Sennheiser ClipMic Digital is a good choice. It’s not cheap but you do get a good quality microphone. As you would expect from Sennheiser the quality of the microphone is excellent and if you need to be doing lapel style interviews this is a good choice. There is no external gain control so you will have to use your app of choice to adjust input gain. 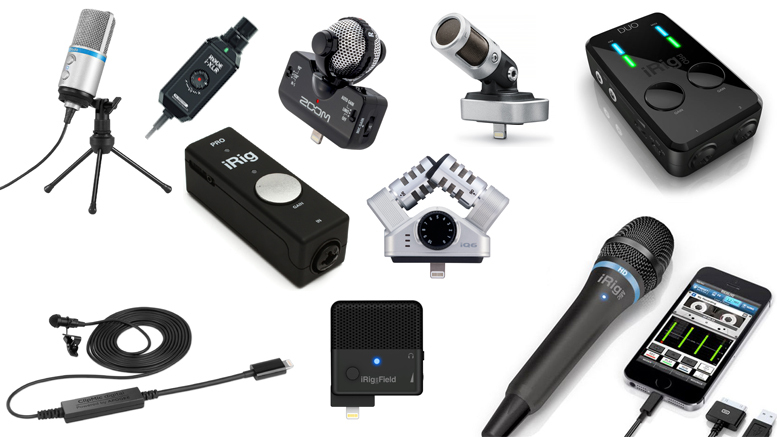 The Irig Mic HD 2 is the successor to the IK Multimedia’s Irig Mic HD. Just like that microphone it is a hand-held condenser microphone that is good for interviews, voiceovers or music applications. It is more expensive than the Irig Mic but the quality is much better. It has a metal body to make it more robust and comes in two different colours black and silver which both have a lightning port connector. It has dial for gain control and a built in pre amp. This is a huge improvement over the cheaper Irig Mic. The pre amp gives improved audio recording and a gain boost to signal. 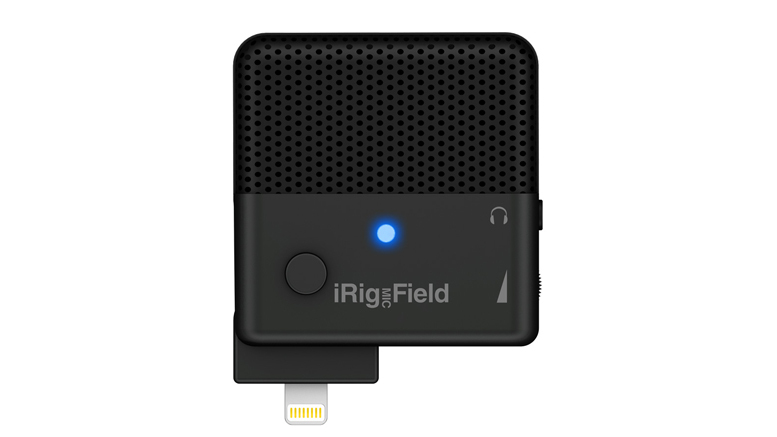 The Irig Field microphone has a similar form design to the Irig Mic Cast. It is more expensive than its budget cousin but this extra expense gives you better quality sound recordings. It is a digital stereo microphone that fits into the lightning port of an iPhone or iPad. This microphone has many uses for video and audio applications and is an excellent replacement for your iPhone’s on-board microphone. It has a built in pre amp which increases the gain and gives better quality audio. It is also small and portable enough for you to carry it with out to much hassle. It has gain control for changing audio levels and indicator lights to warn you if the audio is peaking. The microphone also has a swivel so you can direct the microphone depending on your needs. It also has a headphone port for audio monitoring. 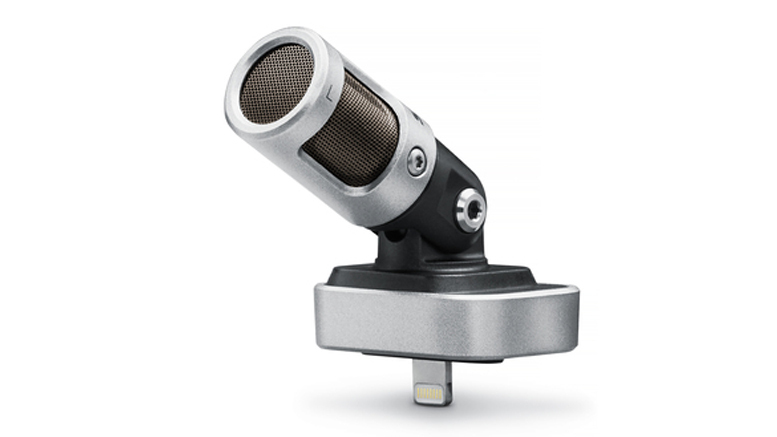 The Shure MV88 is a direction microphone that plugs in directly to the iPhone’s Lightning Port. It has a 90-degree hinge so you can adjust it to different angles to capture the best sound. It has a solid metal construction and comes with a windscreen to cut down any unwanted sound in any environment. IK Multimedia’s Irig Pro Duo gives you the ability to add two XLR microphones to your iPhone by the lightning port. This has many advantages. The first is if you are doing an interview with both the interviewer and interviewee they can both have microphones. The unit has two separate gain controls so each microphone can adjust to the correct level. Added to this is a powerful preamp and phantom power so you can power those microphones that need it. 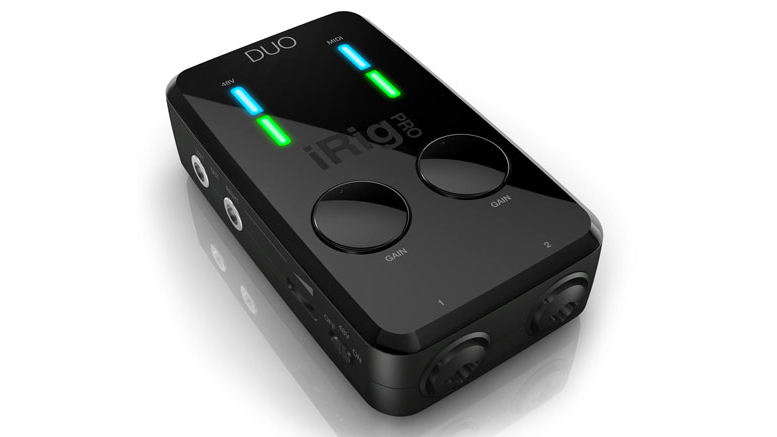 The iRig Pro Duo gets power from two AA batteries so it does not draw power from the iPhone. If you are doing a long recording session you can also hook it up to the mains power supply. Also featured is a headphone port for monitoring audio that has its own volume control. And if you want to hook up instruments it has midi control and 1/4” instrument ports. 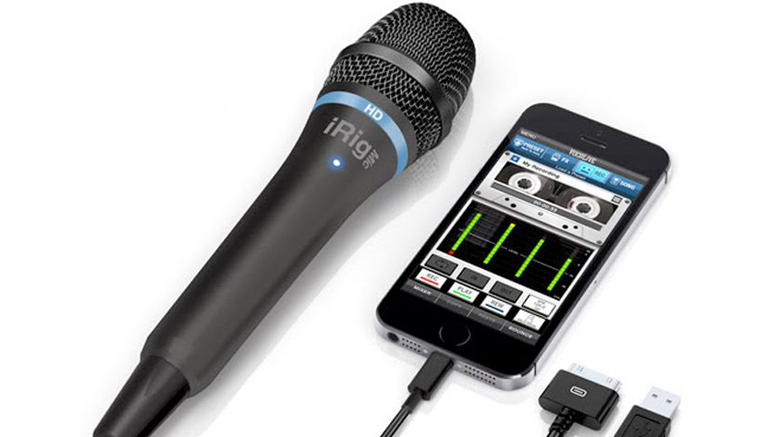 The iRig Mic Studio is an ultra large-diaphragm digital microphone for vocal recording. It comes with many adaptors including a lightning port plug. Which means it should work with the iPhone 7.
iRig Mic Studio comes with a full set of flexible controls. It has a gain control knob and a multicolour LED level indicator. It also includes a headphone output with its own level control for onboard monitoring directly from the iRig Mic Studio itself. The iRig Mic Studio also comes with a sturdy and portable tabletop tripod stand. The microphone is smaller than an iPhone. It features a large 1” diameter back electret condenser capsule, a 24-bit audiophile-grade A/D converter (with 44.1/48 kHz sample rate) and a built-in low-noise high-definition preamp. 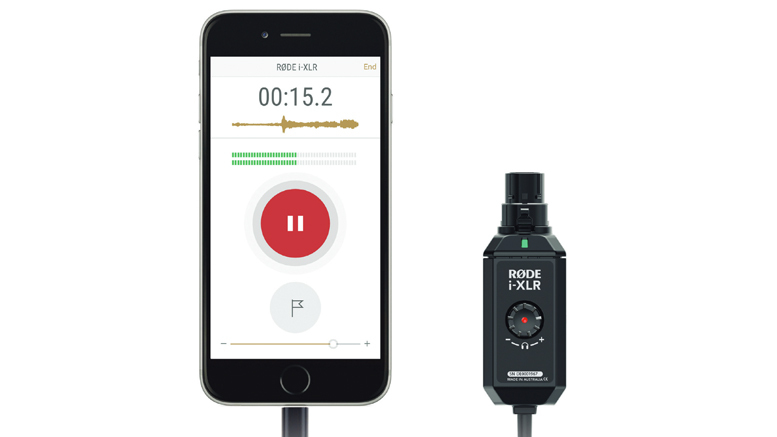 The Rode i-XLR is an XLR adaptor that plugs into any XLR microphone allowing you to connect it to the lightning port of the iPhone. The cable is about three meters long. This should give you enough length to reach your subject. On the unit itself is a level control to adjust headphone volume so if your signal is a little hot you can turn it down. What lets it down is a lack of a preamp. There is also no gain control or phantom power. So if you are an iPhone 7, 8 or X owner it is not all doom and gloom for your choice of microphone. As you can see from this list there are plenty of options. The only problem with these microphones is most draw power from the iPhone and will reduce your battery life. This also means you cannot charge the iPhone while these microphones are attached.